A recent report by the International Committee of the Red Cross said between January and June this year, 17,000 Nigerians went missing from their homes and villages mostly on account of the raging terrorist campaign by Boko Haram, as well as other acts of violence carried out across the country. Out of this number, 7,100 are children. Recently, the International Committee of the Red Cross (ICRC) made a grisly disclosure about the humanitarian disaster going on in Nigeria as a result of the extremist campaign of terrorist and violent groups like Boko Haram, as well as the farmers-cattle herders' clashes. Detailing the crisis in its report, tagged "Facts and Figures Report: January to June 2018", ICRC said no fewer than 17,000 Nigerians had gone missing from their homes. ICRC indicated the development was largely caused by the Boko Haram insurgency and other acts of violence in various parts of the country. 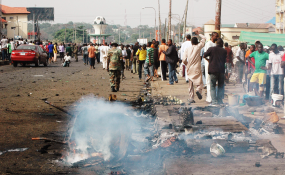 It recalled how the country witnessed increased cases of violence in states, such as Benue, Kaduna, Nasarawa, Plateau and Taraba since January this year, adding that such violent acts claimed and injured several people and forced thousands of others to flee their homes and take refuge in makeshift camps. To underline the depth of the situation, the ICRC report stated that of the 17,000 individuals reportedly missing, over 7,100 were children. It noted that 1,960 fresh tracing requests had been made to the Red Cross by people looking for lost members of their families. ICRC explained, "In the North-east, where the armed conflict is now in its ninth year, violence continues to claim civilian lives and destroy property. Hundreds of thousands of the displaced persons still live in overcrowded camps in the regional centres and depend almost entirely on humanitarian assistance." The ICRC equally noted that it was working with the Nigerian Red Cross Society and other Red Cross societies in the Lake Chad region to find and reunite the missing family members and children with their parents or caretakers. "The ICRC and NRCS are currently seeking to clarify the fate and whereabouts of about 17,000 missing persons in Nigeria, including over 7,100 missing children," said the report. It further stated: "In numbers, over 1,960 fresh tracing requests were opened by persons looking for relatives with the Red Cross. Also, almost 300 Red Cross messages containing family news were exchanged between separated family members." Driving home the depth of its discovery, the ICRC report said: "Over 770 free phone calls were made available by the Red Cross to persons searching for missing family members. Since the beginning of the year, the states of Benue, Kaduna, Nasarawa, Plateau and Taraba have witnessed an increase in communal violence. Civilians have been injured and killed and thousands of families have been forced to flee their homes. In predominantly agrarian communities, the violence has also disrupted their ability to farm and earn a living. "The herders have lost many of their livestock to violence or lack of animal health care, leaving many to depend on humanitarian assistance to meet their basic needs from food and water to shelter and medical care." Stakeholders who spoke to THISDAY on the import of the report noted that it was a weighty one, an indictment of Nigeria's security system, and a statement of failure on the part of the state as regards its obligation to secure the lives of its people. They said the ICRC must be commended for helping to draw attention to the whereabouts of the 17,000 Nigerians and, more importantly, 7,100 children. Just about two years ago, the National Human Rights Commission (NHRC), in collaboration with other ministries, departments and agencies (MDAs) of government and civil society organisations (CSOs), reportedly commenced the process for the establishment and management of database for missing persons in the country. This, according to experts, would, if implemented, provide some process for families whose members are missing to know the fate and whereabouts of their relatives. It would also provide Nigerians credible information on missing citizens, especially in situations where the government may be tempted to deny the development. Providing some perspectives on the development, the programme coordinator of the Paged Initiative, Ummi Bukar, whose organisation has consistently worked with refuges impacted negatively by the Boko Haram in the Borno State, suggested people could still be missing frequently in the North-east on account of Boko Haram's activities, but their disappearances are seldom reported or told to the hearing of the public. While not expressly validating the report of the ICRC, Bukar explained that the terrains in the North-east were still very dangerous and supported the disappearance of people. "There are still on-going Boko Haram activities in communities in the North-east. Many people have lost loved ones this year alone. Several aid workers abducted by the insurgents and some roads are still very dangerous as travellers often get abducted," said Bukar. She explained, "Several people who have lost loved ones are still unable to say if they are still alive or not." When THISDAY asked Bukar if she had spoken with people whose relatives were still missing during her works in the communities, she stated, "Not those who were abducted this year. But, we have spoken to several people who had loved ones abducted. Some were abducted and escaped by themselves." She further stated that while most people wanted to go back to their communities, "they don't think it is safe to do that yet. Some want to return because life as IDPs isn't easy, they prefer to take their chances in their communities. However they are not allowed to go back." Against this backdrop, other experts explained it would be reckless of the government to consider and perhaps treat the ICRC report with levity, just the way it had treated similar reports in the past. Many believe that in line with Section 14(2) of the Nigerian constitution, which states that the security and welfare of all citizens of the country shall be the primary responsibility of government, there is an urgent need for the government to partner with the Red Cross to trace and possibly reunite these missing Nigerians with their families. The thinking is that these missing people may not be dead, as may be commonly concluded, and a realistic attempt to trace their whereabouts would be an immense relief to their families and communities. What is not in doubt is that reports such as the one by the ICRC worsen Nigeria's image crisis, as they portray the country as a place where less and less value is placed on the lives of citizens by the government. But experts say the government can reclaim its image by taking reports on the humanitarian crisis taking place in the country seriously and acting on them, instead of the cliché-ridden resort to denial and criticism.